Metal roofs have leaped generations beyond the old, tin roofs from the barns of yesteryear. They are built to last, with a normal lifespan of fifty to seventy-five years! Metal can be cut in a number of different styles, and it reflects the sun’s rays, keeping your home naturally cooler in the summertime. Using metal is more expensive, however, than using more common materials such as asphalt shingles. Most metal roofs also need to be painted or coated regularly to ensure they don’t rust. 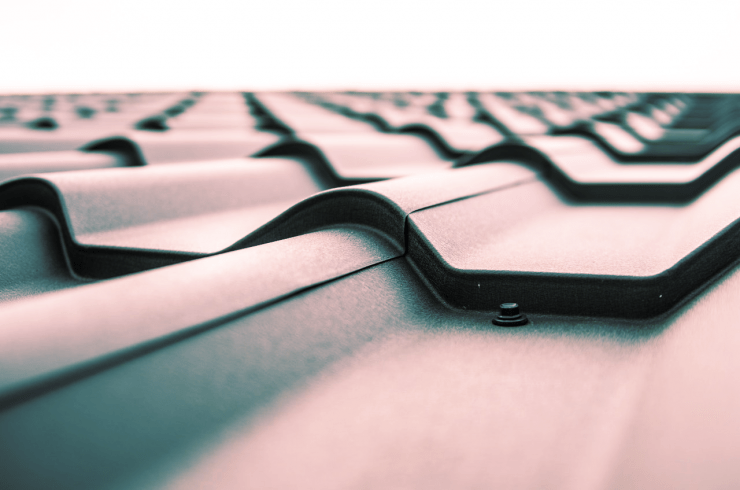 Below you’ll find some key information regarding the types, materials, and architectural styles that are common for metal roofs. R-panel roofs are popular for both residential and commercial buildings. Considered the type with the least amount of required maintenance, R-Panel roofs are easy to install, and therefore less expensive. They are available in a variety of colors and are popular for both residential and commercial buildings. Corrugated metal roofs have patterns and designs that are highly compatible with many structures and styles. This is the classic style of metal roof that is common on many older barns. These days, the corrugated metal pieces are galvanized to fight rusting. Corrugated metal is popular with restaurants and shops as it evokes a traditional feel. 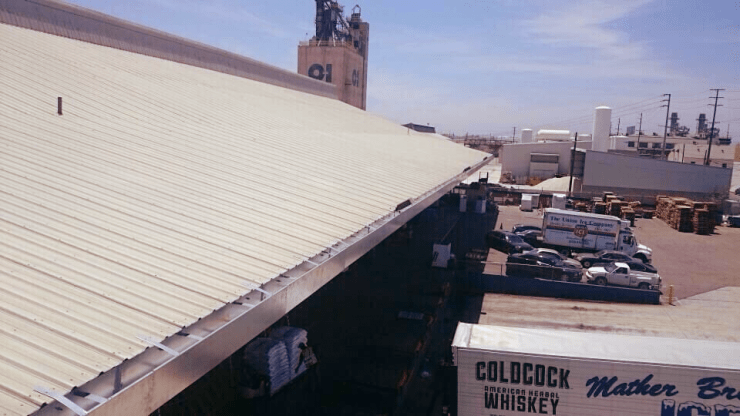 Corrugated metal roofs are easy to integrate with fiberglass skylight panels, as they have patterns and designs that are highly compatible. Architectural Standing Seam roofs are considered more resistant to water and wind. 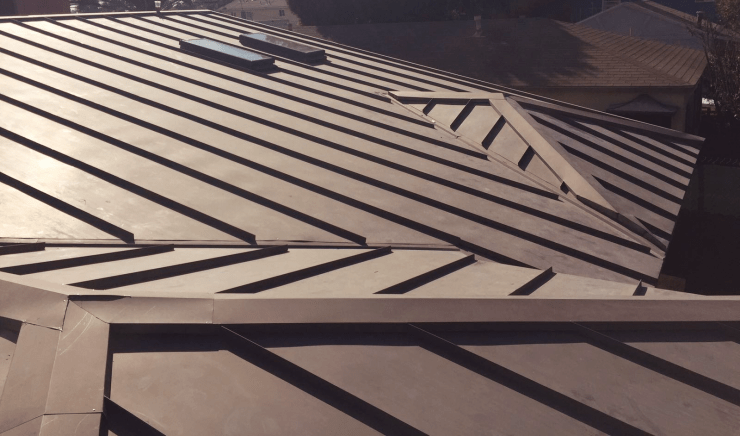 With a unique system of interlocking panels, Architectural Standing Seam roofs are considered more resistant to water and wind uplift than other roofing types. The panels are sealed together to keep water out of the building. Aluminum is popular because it is very lightweight and therefore easier to install. It is also rustproof, although it should still be painted or coated as bare aluminum is not very aesthetically pleasing. Aluminum is not nearly as strong as some other materials, and is easily dented. Heavier and sturdier than aluminum, steel is coated, usually with zinc, to protect it from rust and corrosion. Steel is often using in commercial settings, and therefore the sheets of material are usually given paint finishes that are extremely durable. In use for centuries, copper is rustproof and lacks a finish to scratch or peel off. While it looks beautiful when first installed, its true beauty isn’t fully realized until it ages and develops a beautiful verdigris patina. It’s important to note, however, that copper is considerably more expensive than aluminum or steel. Alloy metals can be specifically designed to enhance strength, durability, weathering, or all three. While prices can vary, alloy in general is considered a more expensive option. Immune to rust or corrosion, stainless-steel roofs can be coated with terne for a natural matte-gray look. Stainless-steel is considered very expensive, however.